Fresh out of the Scorpian Fleet Yards, the Praetorian is the first in her class (named for herself). A brand new design from the defense contractor Reginald-Norde, CF-505 deploys the best DRADIS and weapons systems links that cubits can buy. 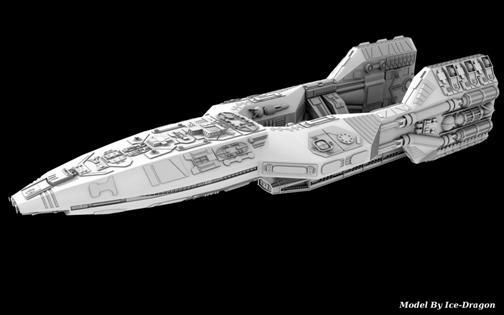 Boasting a crew of 708, she's approximately two-thirds the size of the Galactica and packs more firepower than her entire air wing can put into space in twenty sorties. At 3,201 feet in length, she's the single biggest missile-dedicated ship in the Colonial Fleet, designed from the ground up to perform one duty above all others: to put as many missiles on target as quickly as possible. In other words, she's the ideal missile picket, capable of providing significant fire support for the battle groups on the Armistice Line. Her short-range gun batteries are designed to intercept and destroy incoming enemy missiles so her own missiles can then be used to turn the tide against the enemy. For additional protection, those missile batteries remain hidden behind retractable armor plating while not in use. Each side of the ship holds four missile bays and one hundred point-defense guns, all of which are dorsally emplaced. She is also fitted with a ventral flight pod that allows for rapid replenishment of stockpiles, large enough to hold the two Raptors assigned to the ship. COL Taryn MacLean, CO Not a whole lot is known about the new Praetorian CO. Only promoted to XO relatively recently, as Laughlin finally came to terms with the fact that Ionis would not be returning to the post, she kept a low profile, staying out of the political disputes that more and more constituted interactions between the Fleet commanders. She is reputed to be tough but professional, which helps to preclude the otherwise constant questions regarding whether she's actually old enough to be a major, let alone the post of colonel, to which she was just promoted upon being named CO of the Praetorian after Laughlin's murder. Colonel MacLean is played by Gong Li. CDR Michael Laughlin, Former CO A well-respected professional. Commander Laughlin just finished up a tour commanding the Valkyrie-class Battlestar Excelsior. Following a glowing recommendation from his battlegroup commander, he was selected from a pool of fifteen candidate Commanders for the honor of taking out the lead boat in this new class. Known as a very level-headed commander, he has often been accused of being too detached from his crew for his own good. Whether or not that's true is tough to call as he tends to keep a very strict CIC and private social life, not talking about his personal relationships at all. On April 15, 2042, Laughlin was murdered by Commander Rudolph Kepner. Commander Laughlin was played by Scott Glenn.